Welcome back! This week’s installment of Swatch Sunday is all about Gothic Gala Lacquers‘s Wop Bam Boom, another polish from June’s Beauty Quartet Box. It’s still weird wearing something so new, something that hasn’t had to sit in the Helmer for a year before I got to it. I’m wearing three coats of Wop Bam Boom with two coats of Seche Vite top coat. All photos were taken outdoors in direct sunlight. 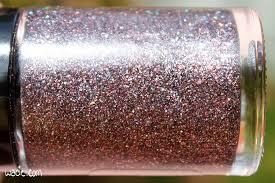 Wop Bam Boom is a full-coverage microglitter polish with glitters in bronze, teal, dusty rose… There are so many colors and finishes of glitter in there that I can’t even pick them all out. Application was fine; the product consistency was very thick and goopy, and I had to thin it out quite a bit. After thinning, it went on easily. I got full coverage in two coats. The polish dries matte; the glitter still shines, but there’s no gloss at all, and it dries with a slightly gritty texture. I added top coat for smoothness and shine. I really like this polish. I love the colors of the individual glitters; they pair together so well. There’s a ton of dimension. There’s something really summery about it, too, even though it’s not bright or cheerful. It pairs beautifully with sparkling swimming pools, deeply tanned skin, and mai tais in tiki mugs. 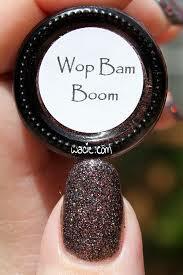 Wop Bam Boom and the rest of the Beauty Quartex Box were pre-ordered limited editions and are now unavailable. Other Gothic Gala polishes are available from their shop. This entry was posted in Swatch Sunday and tagged Gothic Gala Lacquers, indie, microglitter, swatch.